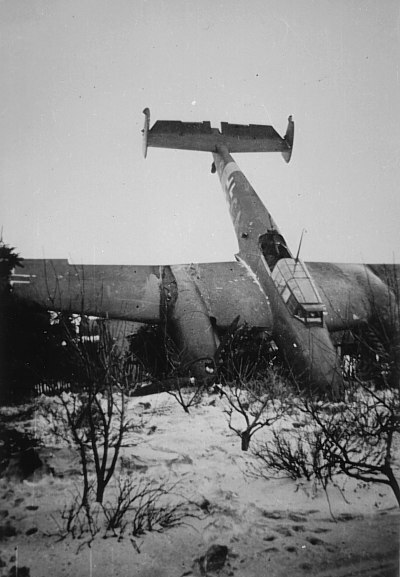 Bf 110C crash landed near Esbjerg 24/2 1942. The aircraft belonged to Erg. Zer. Gr. ? and was coded SO+CA. T/o Esbjerg ? Op: ? Just before noon the Bf 110 attempted a landing in a field near Sædden Strandvej road near Esbjerg. The pilot was not able to stop the aircraft and ran through a fence and a wind mantle and ended up in the gardens belonging to Fisherman Peder K. J. Knak and Carpenter Søren Nielsen at what is today known as Strandvejen road 167. The Bf 110 stood on its nose, but the crew of two were unharmed. A couple of elderly soldiers arrived to guard the aircraft and was billeted in a small garden house for six days until the Bf 110 was dismantled and removed.